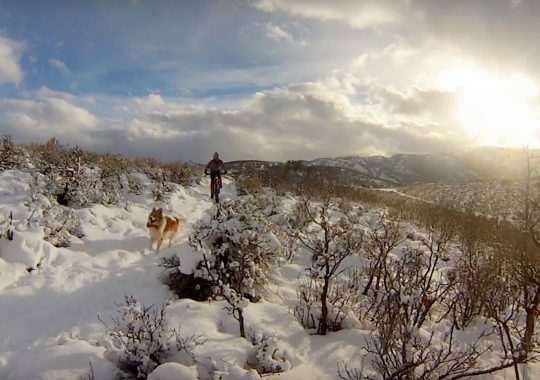 If you think your dog loves mountain biking, they’ll love fat biking even more. 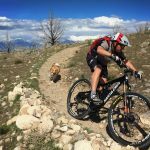 First, the pace is slower and there are no super fast descents so your pooch gets more time to wander and explore. 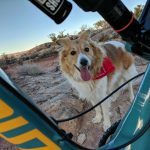 Second, it’s not hot and there is a plethora of water for them to “eat.” With mountain biking, there are many times when the pooch stays home because it’s simply too hot outside, or the distance and/or the pace is simply inappropriate for a dog. 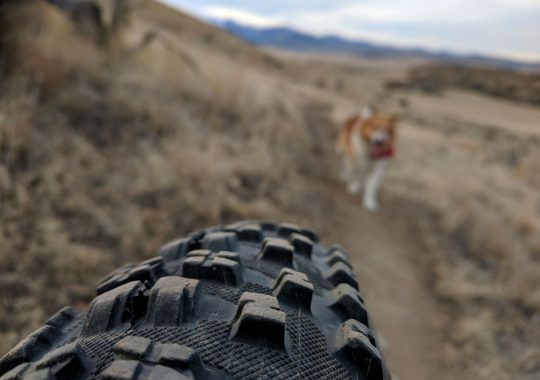 However, when Fat Biking, it’s rare that the dog stays home. 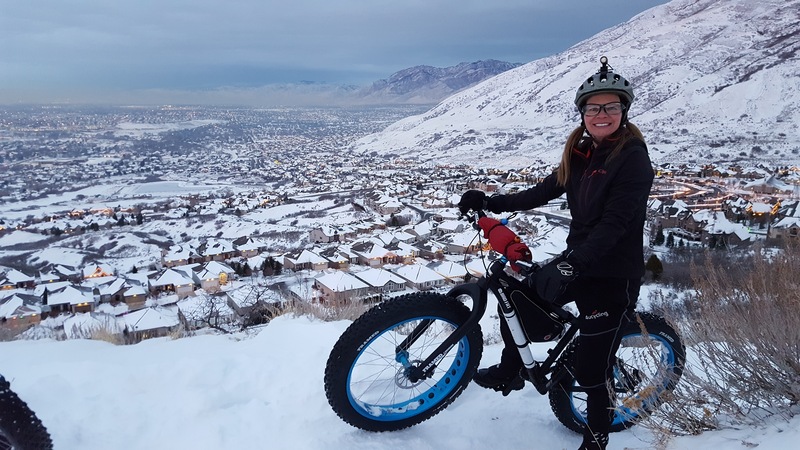 Fat Biking is not mountain biking. Try to think in terms of hours instead of distance. As we’ve mentioned, Fat Biking is not mountain biking. Don’t expect to go out and churn out 20 miles. Try to think in terms of hours instead of distance. Because it is so condition-dependant the quality of the snow makes a world of difference – and conditions not only change from day-to-day but may change over the course of the ride. You may work your guts out for two hours and only travel a few miles. Don’t let that discourage you. The big, heavy tires, low pressure and low gearing make it more like driving a tractor than your trophy-truck mountain bike. You run absurdly low pressure on a fat bike. In most cases, we run a mere three to five psi is all and it’s not unusual to drop into the one to two psi range. You need to best distribute your weight across a, sometimes, very soft surface and since conditions can and will change over the course of a single ride, you may find yourself adding or removing air several times over that one ride. In most cases, three to five psi is all you need, and it’s not unusual to drop into the one to two psi range. You will need a small pump and a fat-bike specific tire pressure gauge that will be accurate with low pressures. We use the Accu-Gauge and have had very good results. Any small, packable bike pump works. We’ve been lugging around the Topeak Master Blaster or the better part of a decade. 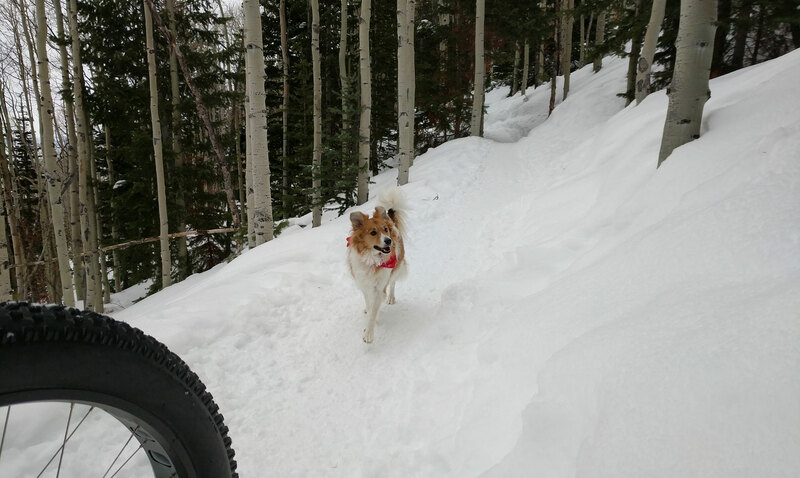 Yes, you want to look for the groomed trails, and if there are no groomed trails in your area, then snowshoers become your best friends. Snowshoes make the trail better for you and you make the trail better for them. 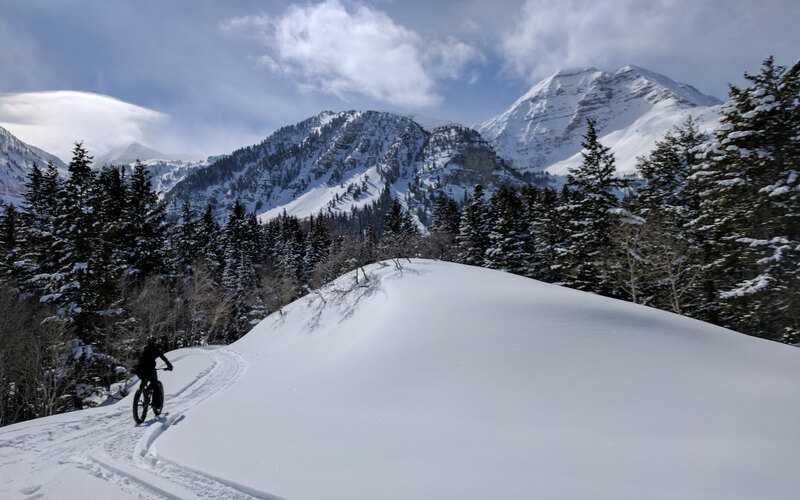 We even know people who bring their snowshoes along on the ride, ride for as far as the can, then stash the bike and snowshoe out a little further to help build out the trails. 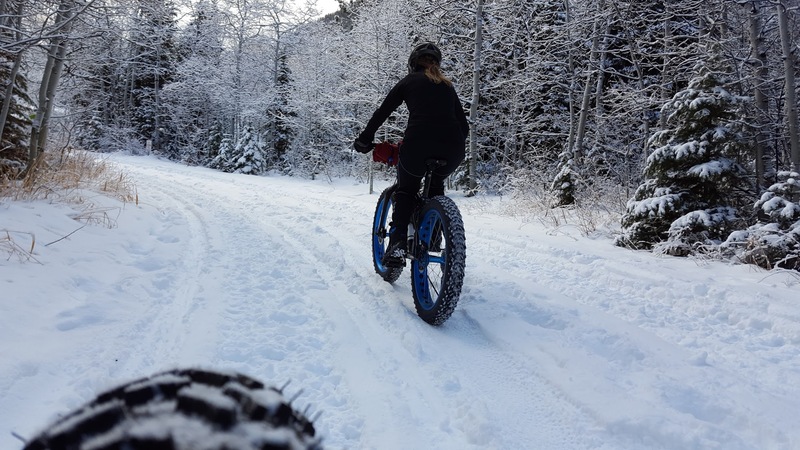 As fat biking is increasing in popularity, more and more areas are beginning to groom specifically for fat bikes. 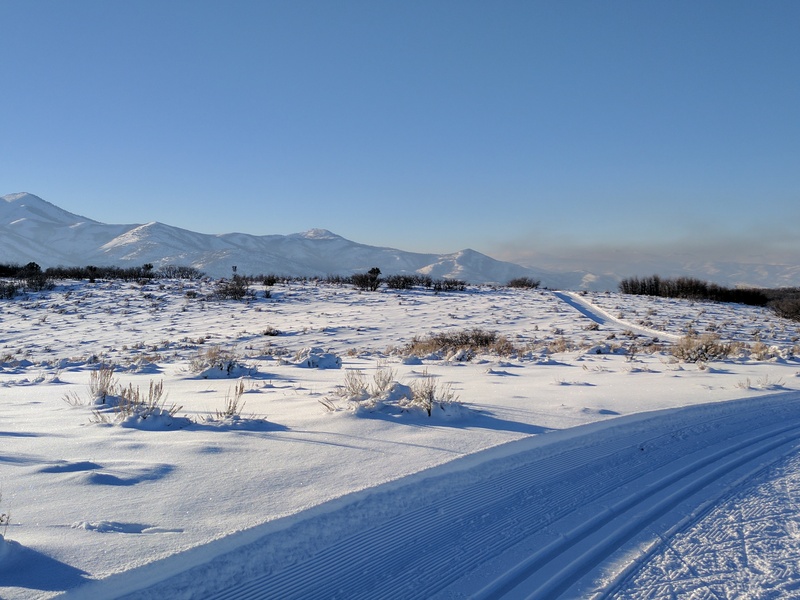 Depending upon the budget of the grooming organization, trails may be groomed with specific trail grooming devices or something homemade, and as simple as a tire filled with concrete, dragged behind a snowmobile. Depending on the snow conditions, you can simply follow snowmobile tracks to access incredible terrain. Singletrack offers the greatest challenge, but also the greatest rewards as you will be entering into a world that few people experience. Even trails that you may ride all summer will look and feel completely unique when it’s hidden under several feet of snow. But be prepared, if it gets too warm, you may be pushing or dragging your bike or suffering just to make it up a gentle grade. 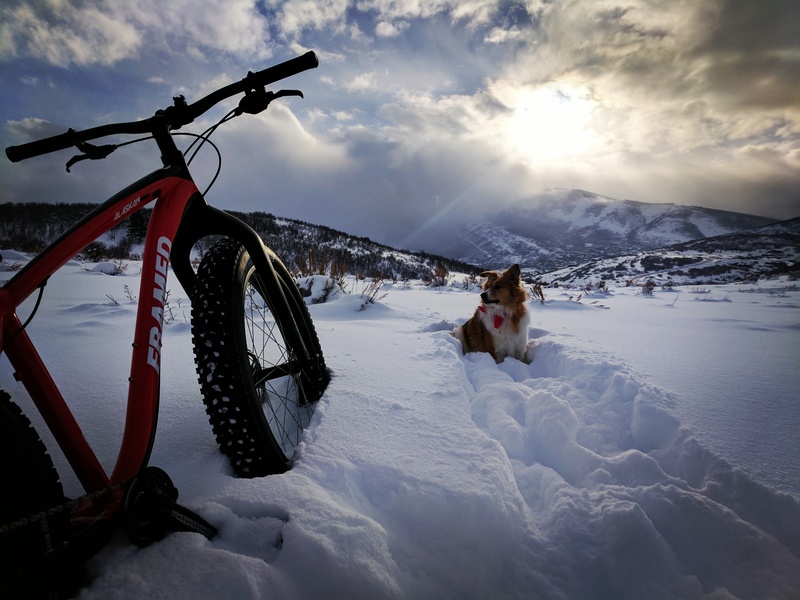 If you are lucky, sometimes the snow will go through an intense thaw/freeze cycle that will put a thick, heavy crust on the surface; a crust so thick that you can ride across the top of it as easily as you would ride on a paved trail, only you can literally go wherever your heart desires. Many cross-country ski areas allow for fat bikes and will groom giant networks of “corduroy”. Etiquette-wise, if you are creating ruts due to running too high of tire pressure or if the snow is too soft it’s best to lower your pressure or not ride. When Fat Bikes chew up the cross country trails it causes conflict that can result in Fat Bikes getting banned from these trails. 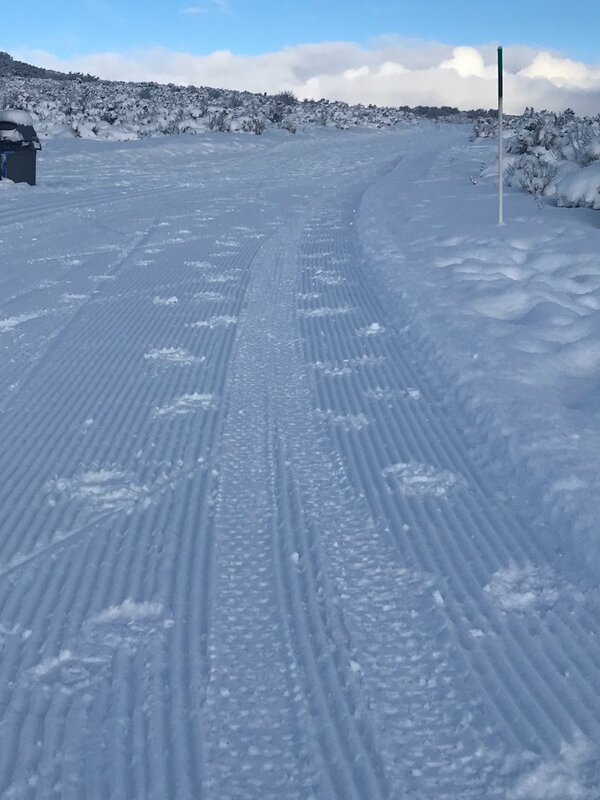 Additionally, many cross-country ski areas will groom “classic” ski tracks. These are the two parallel grooves cut into the snow. As a fat biker, you want to go out of your way to avoid coming into contact with the classic groomed trails. However, the wider freestyle groomed trails, it’s most often fine for you to ride on as long as you, as we’ve mentioned, are not sinking into the snow. Additionally, it’s best to ride on the edge of the wider groomed trails to minimize any damage, and to allow skating skiers to get past you. When you ride in the center of a wide, groomed track, you are pretty much in everyone’s way. If you are causing ruts, either lower your pressure and if that doesn’t work, maybe don’t ride that day. Keep in mind that areas groomed for cross-country skiing, skiers should be given all the courtesies possible. As fat bikers, we are guests on their trails and we should do our best to behave accordingly to prevent conflicts. And as we’ve already mentioned, if you are causing ruts, either lower your pressure and if that doesn’t work, maybe don’t ride that day. You will become a Jedi-ninja-master of layering. And yes, you will get cold and yes, you will get hot. 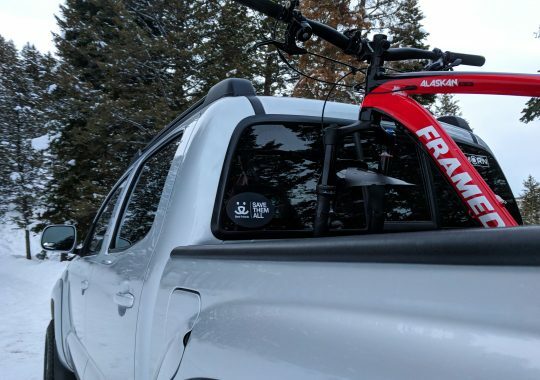 The temperature swings can be so wide that many fat bike riders opt to not carry a camelback and instead fasten items onto their bike using small Bungie ball ties or fat bike specific frame bags so they can adjust quickly and not suffer from a sweaty back if it gets colder. Pants were one of the hardest things to figure out. Many cycling-specific kit is incredibly expensive but the 4uCycling pants from Amazon proved to be the greatest value and they work incredibly well. The price is so reasonable you could buy three pairs for the price of one pair of athletic pants from a local bike shop. However, these do come out of Asia and are sized as such. Order a size or two larger than normal to ensure they fit. The 4uCycling pants from Amazon proved to be the greatest value and they work incredibly well. Boots and pedals were a little easier to figure out. We started off using just whatever warm hiking boots we had around, but they weren’t quite warm enough, nor were they stiff enough. There are insulated fat bike specific shoes available. The Nylon-Body (not aluminum) Flat Pedal and a pair of Vasque Snowburbon boots were a very easy way to get started. The added benefit is instead of having an expensive pair of boots that can only be used on a bicycle, you now have an expensive pair of boots that you can wear whenever you need to. 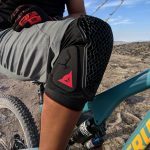 Once you get better at riding in the snow, or if you just have to have your clipless pedals, it’s best to use an enduro-style clipless pedal, the kind that still has a traditional pedal body surrounding the clip. This allows you to still make solid connection to a pedal when you are struggling in soft, “mashed-potato” snow. We are big fans of the Crank Brothers Mallet line of pedals. The Mallet 2 is a fantastic, affordable option, but you can always step-up to the lighter Mallet E’s. Even though the Candy does have a cage around the clips, there aren’t any pins so they can be really slippery. There are few things we love more than our simple, modest Merino Wool Buff. This simple tube of cloth is perfect for wrapping your ears and the top of your head, or just your ears or just your neck. It’s incredibly flexible and easy to adjust to constantly changing temperatures. They come in a million different styles and colors and we find ourselves using them all year long for just about every outdoor activity. Finally, we always carry hand/foot warmers and stuff them into pockets, shoes or gloves or even internal jacket pockets, just in case the temperature drops more than we anticipated. The days are short and in many cases, the daytime may be too warm. Get a headlamp and venture out even after the sun has set. 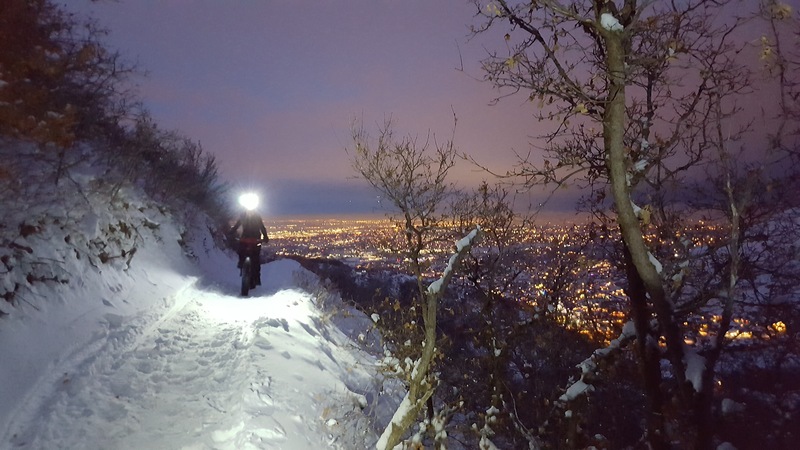 The cooler temperatures at night make the snow firmer and easier to ride on, and it truly can be a purely magical experience to ride during a light snowstorm in the dark. Everything is silent except for the snow crunching under your tires. Riding at night and riding when it’s snowing made us feel more like a kid again than pretty much any other activity. Again, Asian products from Amazon proved to be extremely affordable and very functional for our needs. There are a myriad of choices, but try to find one that puts out at least 1,000 lumens. In addition to a light on our helmets, we run an auxiliary, smaller light on our handlebars. Having two points of light provides more depth perception and if one battery happens to fail, you still have another light. First, be sure to read our “Trail Basics” article. 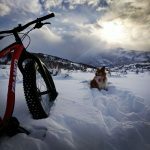 Most of what is in there remains true to Fat Biking. When it’s cooler and the surface is so smooth, dogs actually have a lot less to worry about. First and foremost, for the dogs’ safety, you need to consider the temperature. Just like us, if it’s too cold they can suffer, particularly their feet. We’ve found that 15º Fahrenheit (-10º C) is the absolute lowest we’ll take them out, and honestly, once it’s colder than that it starts to get kinda’ miserable for us. Of course, your local temperatures may feel way colder than that depending upon humidity, so be smart. When the temperatures are hovering right around or just below freezing (32º F/0º C) it’s about ideal. It’s cold enough for the snow to stay stable, but not so cold that your face starts to freeze. The biggest problem Chase faces is snow and ice getting balled up between his toes. On would think that boots would be the clear solution. We’ve tried them all with very mixed results. The biggest problem is that dogs don’t have a wrist or an ankle so there is no real good way to keep the boots from flying off. So many times the dog will run and flick their feet to get the boots off, sending one bootie sailing into the air never to be seen again. But before you order up a set, most dogs front feet are bigger than their back feet, so you may need to order two different sizes. 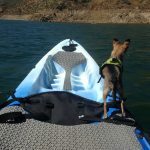 Ruffwear offers boots in pairs as well as sets of four. For example, 30lb Chase wears a Small front boot, and an extra small back boot. In either case, keep a close eye on your dogs feet. 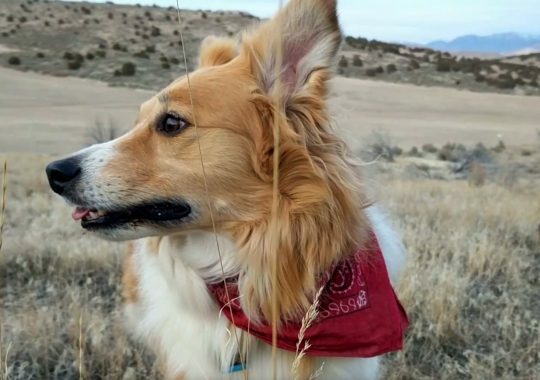 In addition to booties, there are several balms and ointments that are designed to keep your dogs feet happy and healthy. 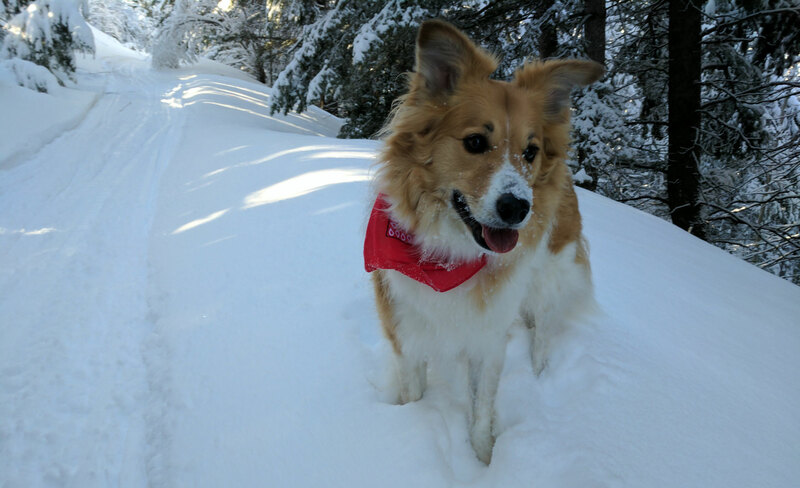 Your results will vary based on your dog, their coat and the texture of your snow. We find that when the conditions are such that he snow is balling up regularly between his toes, simply stopping frequently to clean them out is the best course of action. 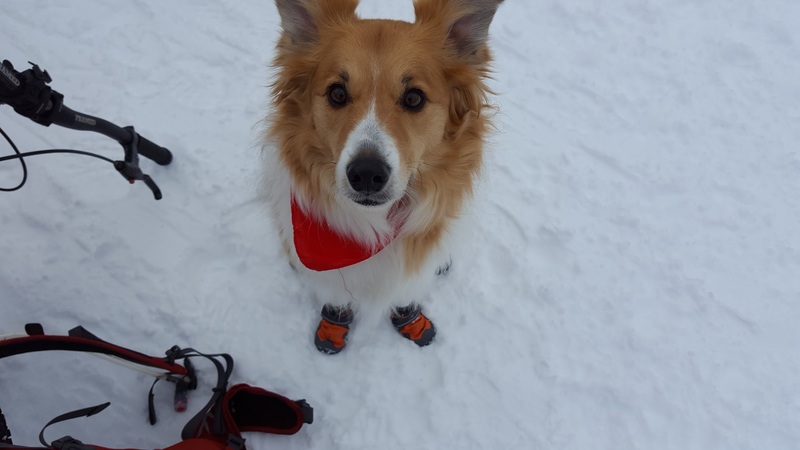 We’ve seen several dogs whose owners neglect cleaning out the snow until the point where the ice starts to cut into their paws and they start bleeding. Be careful of this and keep your dogs paws happy.